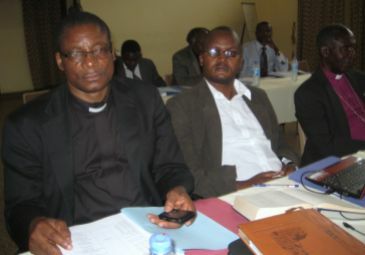 The first General Assembly of Lake Tanganyika Diocese held in Sumbawanga, Rukwa Region 10  11 January 2014 among other things elected its leaders. Those elected are Rev. Ambele Anyigulile Mwaipopo who becomes Bishop and Rev. David Masaoe to become Assistant to the Bishop. Their consecration takes place in September this year. Before his new appointment Rev. Mwaipopo was the ELCT Deputy Secretary General for Mission and Evangelism from 2000 while Rev. Masaoe was a Pastor who has served in various parishes in the then Rukwa Mission Area as the Diocese was known then. The diocese occupies Rukwa and Katavi Regions. Announcing the outcome of the elections recently, the ELCT Deputy Secretary for Finance and Administration, Mr. Abel Mrema, urged the staff at the head office of ELCT to pray for the two leaders as they assumed their new posts. Rev. Mwaipopo has served as Secretary for Mission and Evangelism in the ELCT Konde Diocese as well as a pastor in various parishes of the same Diocese. (Left) Rev. Ambele Mwaipopo, Bishop-elect of ELCT Lake Tanganyika Diocese at a recent Executive Council meeting others are Mr. Naymann Chavalla the General Secretary of Iringa Diocese followed by the former Bishop of South Central Diocese, Dr. Hance Mwakabana (Right). He is a Gettsburg Seminary alumni where he was awarded Master of Sacred Theology (STM) Degree in 1994. He graduated a Bachelor of Divinity (BD) Degree in 1992 and obtained a Theology Certificate in 1985 from the then Lutheran Theological College Makumira (LTCM) now Tumaini University Makumira (TUMA). In 2008 the Bishop-elect graduated Master of Business Administration (MBA) studies offered by theArusha based Eastern and Southern Africa Management Institute (ESAMI).